Labor Day is a celebrated to honor the sacrifice and struggle of American workers who made it possible for the country to dream big and achieve brilliant things. These American workers who build roads, bridges, stand on streets, grocery stores, planes and trains to make them run safely. Labor Day is the perfect occasion to salute the struggle of these millions of workers who get up from the bed every day to care about the people of the country. And what can be a better way to wish Labor Day to your loved ones than Labor Day cards. Why design personalized Labor Day cards with greeting card design software? 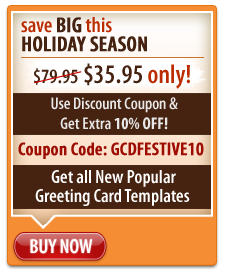 The greeting card making software will help you to design the card of your choice and add custom tag lines and messages. Through Labor Day greetings, you can easily get in touch with people you love and appreciate what people do for you. People commemorate the day in different ways but you can do it in a joyful manner by creating personalized Labor Day greeting cards. You can either print these happy Labor Day cards to post them or send them to your loved ones via email. You can also share them instantly on Picasa, Facebook and flickr. Get your copy of greeting card software now and express your gratitude towards the workers who continuously put in their efforts to make the country better.